Levys father died when he was very young and his mother was always ill. As a result, she was not able to provide for him and so he bounced from place to place and he stayed with different family members. Ultimately, no one took responsibility for him and he realized his future was up to him alone. Levy always understood the importance of education and so worked hard to remain in school, often working for school administration in exchange for school fees or requirements. Unfortunately, his hard work and perseverance wasn’t always enough and he spent some time living on the streets in both Entebbe and in Jinja. Now as an artist, he paints to portray the lives and struggles of street children in an effort to raise awareness. In addition to his talent in art, he is also a very gifted dancer, choreogrpaher, beat boxer, and more. 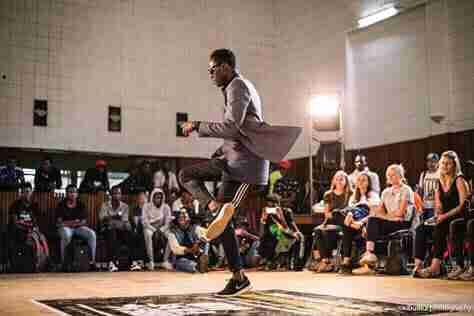 In his time off, he offers dance fitness classes vulnerable children in the community. Levy is strong, courageous and kind and even through his struggles, has become a contributing member of society. He has applied for school support for his Bachelors Program and is pursuing a degree in Art and Design. He has aspirations to continue his studies and to obtain a Masters degree as well. Levy wants to become a professional artist, to have an art gallery and also to become a teacher or a lecturer at University. He says that he wants to use art and dance to communicate, inspire and motivate others. In general, he wants to be a positive role model in both visual and performing arts–we believe that with a little hand up, there is no limit to what he can accomplish.